Themed Entertainment water features are designed to delight and amaze. 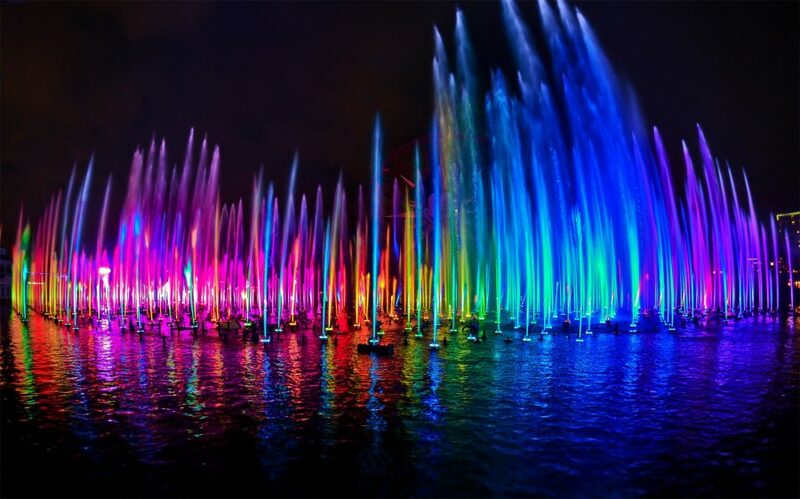 Complemented by Lighting, Audio, Video, Laser, Pyrotechnics, Live Action, or Animatronics, water can become the pivotal element of major shows and attractions inside theme parks or other high-profile destinations. We design everything from the water effects and underwater lighting, to the high-tech fountain control systems that support the show. All of these elements are choreographed as part of an elaborate production that enhances the visual storytelling and leaves the audience in awe. Whether taking place inside a cavernous attraction or on display across a large lagoon, themed entertainment water feature shows are as carefully orchestrated as a piece of cinema. The show elements combine with moving water to convey a story and create a one-of-a-kind viewer experience that is choreographed down to the second. Our design studio selects every effect—from shooting water high in the sky to spraying a mist across a stage or showering a curtain of water down below—to work in tandem with the effects from all members of the production group. Projected film meets a water wall; orange flames blast simultaneously with nozzle jets. Using advanced previsualization software and tools, the project team can see a realistic animated model for the finished show. 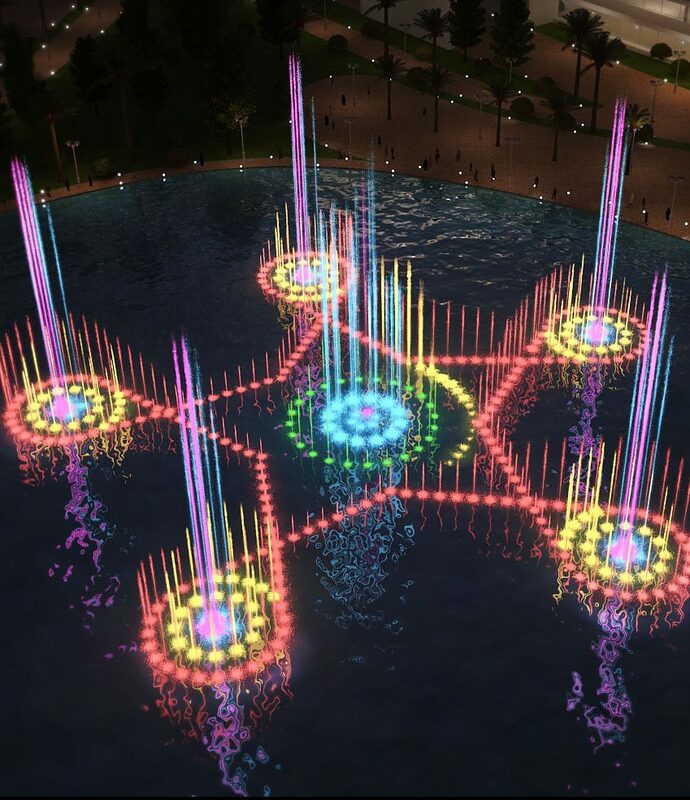 The most imaginative minds in the industry can put together a myriad of ideas for how water features are incorporated into a themed entertainment spectacular, but it is up to our team at ADE to turn their vision into reality. Our engineering studio is well versed in creating all different types of water effects, and our decades of experience have taught us how to seamlessly assemble the exact nozzle, jet, or lighting component to produce the right fluid movements. The drawing packages that we produce are signed and sealed by our expert team of professionals, ensuring that the project is sound from a mechanical, chemical, electrical, and structural engineering standpoint, all to complement our water special effects team. With so many moving parts in a themed entertainment water feature show, owners can rest assured that ADE’s team of project managers helps oversee the installation and testing of equipment along critical phases of construction. We understand the tight deadlines for opening themed attractions and other highly-anticipated shows, making it crucial for every on-site change to run smoothly. The finished show is precisely synchronized with the collection of other special effects so that it can be repeated hundreds or thousands of times over again. Our experience working with the top brands in the theme park and attractions industry has created some of the best and most iconic show spectaculars today. Incorporating the use of valuable intellectual property and innovative technologies, many of these shows remain confidential to preserve the behind-the-scenes magic. However, with our creative clout and engineering expertise, we can produce a showstopping water feature spectacular that everyone will be talking about. Let us help you design the perfect fit for your themed entertainment vision.